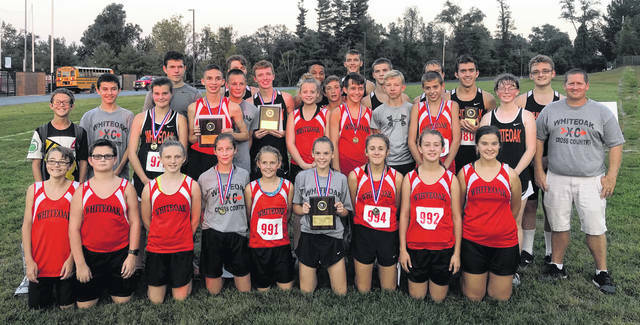 The Whiteoak High School and Junior High cross country teams gather at Jackson High School on Thursday following the Jackson Invitational. A hot and humid day at Jackson’s very difficult course didn’t bother the Wilcats cross country teams. Jr High boys and girls both handily won first place in their races and varsity boys took home second place. Senior Hunter Morgan won the varsity race by 38 seconds against the field of 70 competitors. Atlee Carr was big for the Wilcats coming in sixth place. Zach DeAtley with a great run took home the 13th place medal. Logan Cummings, Robbie Raines, Bryce Bailey and Bradley Ashbaugh all earned ribbons for their wonderful performances. Rounding out the places for the runner up Wildcats was Gavin Tebo 47th, Cody Everhart 48th, Tristen Helterbrand 54th, Connor Butler 58th, Gabe Sheppard 63rd. In the Varsity Girls race Ariel Farahay medaled with a 20th place finish and Mirissa Fahrian finished 45th. Jr High Boys were led by Evan DeAtley with a 4th place finish and his teammates Westin Blair and Wade Evans finished right after him in 5th and 6th. Christian Hill was 10th while Lance Gruber took 22nd and Jake Ward 38th. Whiteoak was 13 points better than runner up Jackson. Jr High Girls were led by Claire Ames who took 3rd place. Jaylie Parr was 8th and Lydia Carr 9th. Kelsey Monteith finished 11th, Brianna Hill 12th, Molly McMullen 17th, Madison Thompson 19th and Brooklynne Campbell 21st. Whiteoak defeated runner up Huntington Ross by 14 points. Doug Hughes, the Whiteoak Wildcats Cross Country coach submitted this article. https://www.timesgazette.com/wp-content/uploads/sites/33/2018/09/web1_Whiteoak-XC-at-Jackson.jpgThe Whiteoak High School and Junior High cross country teams gather at Jackson High School on Thursday following the Jackson Invitational.